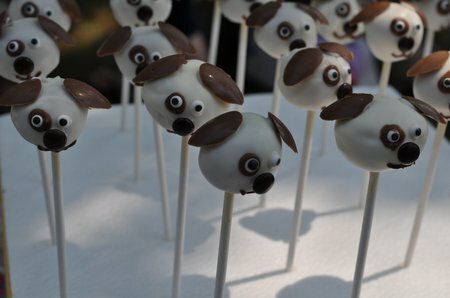 In preparation for my little friend Allie’s puppy dog themed birthday party, I wanted to make some puppy dog cake pops. 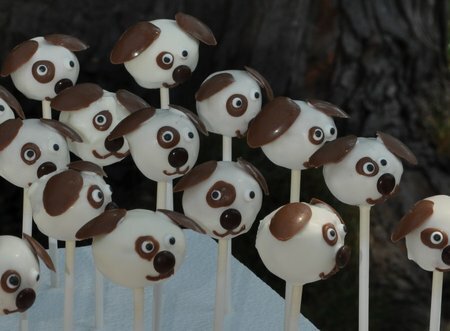 If you’re not familiar with cake pops they are a mix of cake and icing rolled into a ball, and coated with chocolate. 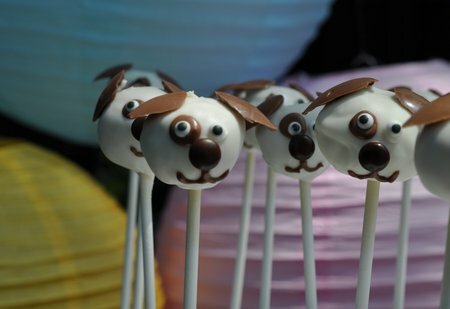 I was inspired by Bakerella’s “Puppy Pops”, and pretty much followed her instructions. I’ve made cake pops a few times, (see my lady bug cake pops here) and them seem to come out better with each attempt. This time I went with vanilla cake, and vanilla frosting for the inside. I’m not a huge chocolate fan, and in the past when other’s have love, love, loved them, I thought they were cute but could take them or leave them. 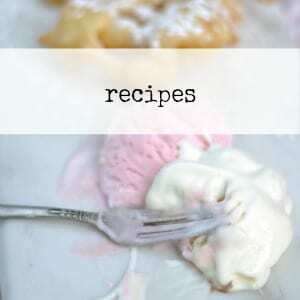 I am now a convert, the vanilla -vanilla combo was, in my humble vanilla loving opinion, the best! 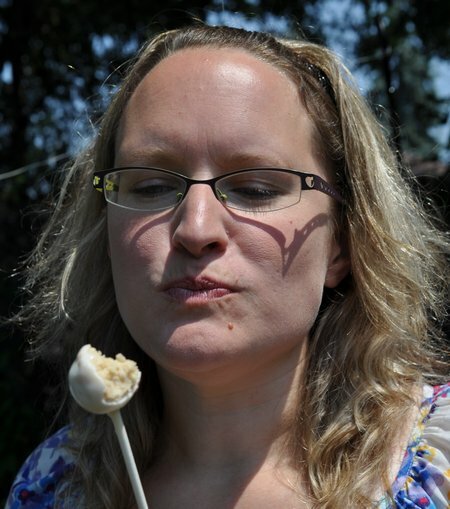 Here’s the hostess, Heather, enjoying one. I made regular cake pops with vanilla cake, and vanilla frosting, and covered them in white chocolate. To make them into puppy dogs, I added eyed, ears, mouths and noses. The eyes are little icing candy eyes you can buy at a candy making supply store. 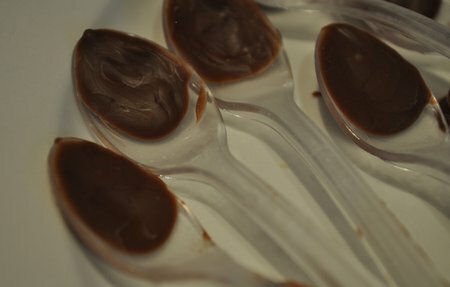 The ears are formed on a spoon, out of milk chocolate. Bakerella suggested drawing a tear shape on a plastic spoon, filling it in with melted chocolate, and popping it out when it had hardened. I remembered that I had little mini cocktail size spoons. They worked perfectly and I was able to fill the whole spoon, so I think it was a little less fiddly than filling in the outline of on a larger spoon would be. The eyes, nose, and ears were attached with a little melted chocolate used as glue. The noses were mini M and M’s. For the mouth detail, I tried to use my food writer edible markers but they didn’t work well on the chocolate. I ended up melting more milk chocolate in a zip lock bag, cutting a very tiny hole in the corner, and using it like a piping bag to create the mouth. I love how they turned out and they were a real hit at the party. 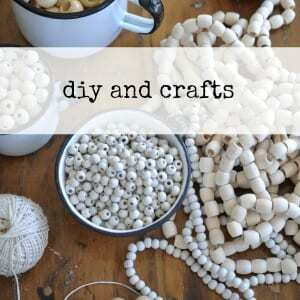 To display them I bought a piece of foam at bulk barn that is for a faux wedding cake. 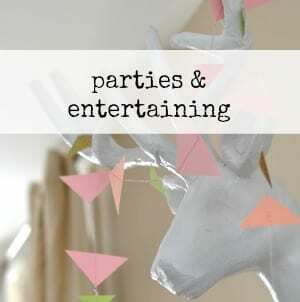 I pushed the pops in and wrapped the outside with a little fabric and ribbon to match the rest of the party decor. 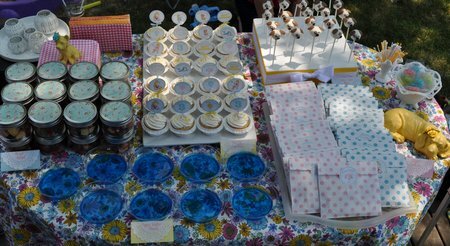 Here they are on the puppy dog themed dessert table. 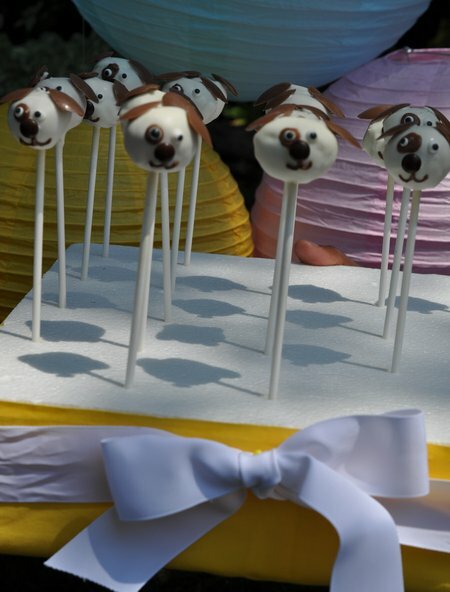 With puppy dog cake pops, or “cake pups”, life really is a party!